Funnily enough, although I don’t particularly care for karaoke, it’s normally me who has to introduce the people taking part. You see, I don’t mind making a fool of myself. I even sing a couple of songs if I’m given the chance. 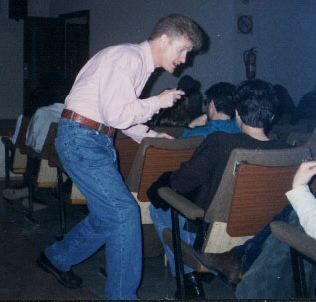 In this particular photograph I am not attacking a member of the public, I am mingling with the audience and trying to get them to sing like a true professional. As you can, the student is completely ignoring me! 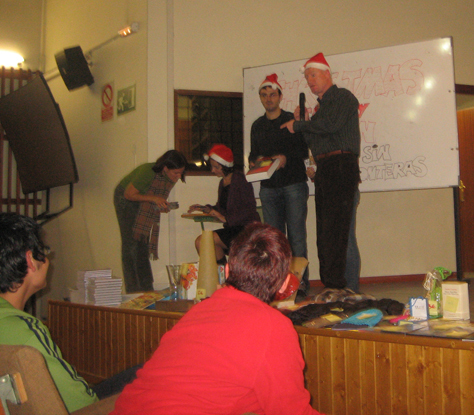 Karaoke is a great activity to learn a language as when you are singing you forget about the language as you are much more worried about keeping up with the music and doing your thing on stage. This was in the Escola Oficial in Valencia. When? I can’t remember. 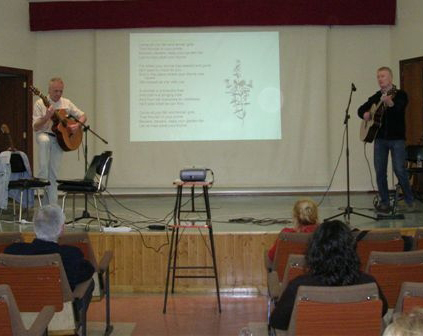 A folk concert at the Escola Oficial with Roland Pearson in 2005. This entry was posted on 28 November 2013 at 11:29 am	and is filed under General. . You can follow any responses to this entry through the RSS 2.0 feed. Both comments and pings are currently closed.